We get a lot of queries asking if we trek in extreme weathers, the answer is yes… We trek whatever the weather… snow, hail, wind and rain but this extreme heat is the only weather we would have to cancel in. 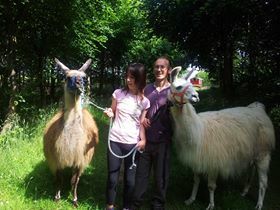 Lucky for us we have 20 acres of lovely, cool, shady native woodland that we trek around on the farm, If it wasn’t for our Catanger woodland we would have had to cancel some of our afternoon trek as this heat can be too much for our lovely llamas. Here is Fudge and Charlie fully appreciating their shaded woodland walk.